"In recounting the deeds that led firefighters of various ranks to capture 51 of the 65 medals presented June 4 on FDNY Medal Day, there was a recurring theme: battling through poor visibility as flames and smoke intensified to pull people trapped in their homes to safety. None did it better than Lieut. Robert E. Lee. Normally assigned to Battalion 16 in The Bronx, he was detailed to Ladder Co. 47 on Oct. 28 last year when shortly after 4 a.m. a report came in of six people trapped inside a private home. As the company’s rig left its Castle Hill Ave. quarters, Lieutenant Lee was already figuring some of those people would not find their way to safety by the time their truck arrived because of the hour of the blaze. “We knew at the time, private dwelling, there were gonna be people in there,” he told reporters at the 69th Regiment Armory on Lexington Ave.
By the time they arrived, they learned that two children had been passed out of the building to neighbors. When Lieutenant Lee led his forcible-entry team into the building, they were confronted by heavy smoke and high heat from the open basement stairwell. “Even without the protection of a hose line, he led his firefighters forward, undaunted, unwavering,” Mayor de Blasio told the large crowd of award-winners, family members and members of their companies inside the armory. The Lieutenant dispatched two of his firefighters to conduct a search inside the front of the building while moving toward the back himself. A hallway led him to a rear bedroom where the door was closed while a fire burned in the basement, making it impossible to move a hose line in there to get water on the blaze from below. Mr. Lee, who is 43, tried the door and found it partly blocked by furniture inside the bedroom, forcing him to squeeze his way in and, while unable to see anything, found an adult woman lying on the floor, unresponsive. He pulled some debris off her and then maneuvered her towards the doorway and through the narrow opening, then dragged her down the hallway and onto the sidewalk where she could receive medical attention. He was exhausted, but it didn’t matter: he re-entered the building, passing one of his firefighters and others from Rescue 3; in both cases they were bringing other trapped people to safety. He made his way back to the rear bedroom, and during a search underneath a bed found a child lying there who he later learned was 13. He seemed to feel he was being given too much credit, insisting he did what any firefighter would do if placed in the same circumstances, and made a point of asking that a Firefighter from Rescue 3, Dave Donatelli, be mentioned for his efforts inside the building. The Fire Department wasn’t as inclined to shrug off the feat as just one of those things anyone might do in his place: it gave Lieutenant Lee the James Gordon Bennett Medal, the FDNY’s highest award, and he also received the New York State Fire Chiefs Association Medal. The 19-year veteran, who prior to joining the department spent four years in the Navy and served in Operation Desert Storm, said he had yet to meet face to face the woman and her daughter whose lives he had saved, explaining that they had come to the company on days when he wasn’t working and met other firefighters who had been involved. But the chance to meet those you’ve rescued, he said, is “probably the most rewarding part of the whole thing. This’’—meaning the awards ceremony—“is nice, but seeing the person face to face is the most rewarding.”"
Whatever happened to that E-One? Wow, 47 Truck has a huge response area, 1st-3rd Due. Love love seeing the response area maps posted in the firehouses. Any more out there for companies?? You should've seen their response area before Ladders 54, 58 & 61 came on. Stumptown’s new coffee bar in the Cobble Hill neighborhood of Brooklyn, New York. Portland, Oregon-based Stumptown Coffee Roasters today opened its third cafe in the New York area, inside an historic firehouse building in Brooklyn’s Cobble Hill neighborhood. Tom you are on the money.My aunt lived in Parkchester in the 50's and I used to walk to L47 (separate house from 64).I counted the Boxes on the running board which was in the Housewatch area and they had 654 first alarm boxes.I don't remember how may boxes L47 ran in with L31 but they did have some. Engine 282/Ladder 148 firehouse 4210 12th Avenue Borough Park, Brooklyn Division 11, Battalion 48 "It Ain't Easy"
Hundreds of uniformed firefighters filled the quarters of Engine 282 and Ladder 148 last Thursday to celebrate 100 years of service to the community. Firefighters past and present of EC 282 and Ladder 148 joined together with family and friends to celebrate the firehouse's centennial. The mood of the ceremony was at times silly, as past and present firefighters joked about shared memories, and at times somber, such as when current captain of Ladder 148 Michael Doda remembered those who have lost their lives in service. Doda gave a brief history of Engine 282 and Ladder 148. Hook and Ladder 148 was organized on May 15, 1914, under the command of Captain David O’Keefe. Engine 282 was then added, and two lieutenants and 100 firefighters were assembled from neighboring companies. He reflected on the similarities that have persisted throughout 100 years of the firehouse's history. “There’s an old proverb: ‘The more things change, the more things stay the same,’” Doda said. “This will always ring true for the New York City Fire Department. If Captain O’Keefe walked through those doors today, the changes to the neighborhood, the fire service, the world may be unimaginable to him. But the one constant is the perpetual brotherhood. “Today, much like Captain O’Keefe in 1914, I find myself surrounded by hardworking firefighters dedicated to making this house the best we have to offer,” he added. This letter was read during the celebration in 2014. 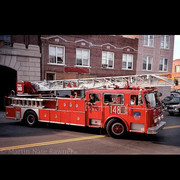 On May 15th, 1914 Hook & Ladder Company 148 was under the command of Captain David O’Keefe. A new motorized ladder truck was placed in quarters with Engine Company 282. Ladder 148 was needed to provide protection to the neighborhoods between Engine 247 and Engine 250. The two Lieutenants and eleven firefighters that formed the company were assembled primarily for neighboring companies. As when any new company is formed firefighters, and officers are selected for being hard working and dedicated professionals. I marvel at what Captain O’Keefe was faced with. He had a new unit in a bourgeoning area of Brooklyn. Once called Blythebourne (Scottish for happy home) the area began to be populated in 1887 with small cottages, but soon the streets began to bustle with people, and large fancy Queen Anne style private homes were added to the landscape. The area between the Bath Beach Railroad and the West End Line, now called Boro Park, was becoming sought after and the population was exploding. 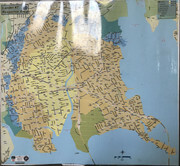 By the time Ladder 148 was formed, Brooklyn Rapid Transit had begun to elevate both lines of the train and consolidate some of the smaller lines. By the 1920's single family homes were giving way to large multifamily apartment buildings, each with a uniformed doorman, in response to the growing demand for housing. 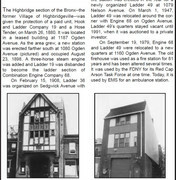 Ladder 148 was established shortly after the second major reorganization of the FDNY on January 1, 1913. 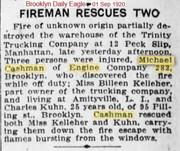 Many older Brooklyn Fire Companies were renumbered as in 1898 and four 'Combination' Engine Companies surrounding New Utrecht had their horse drawn ladder disbanded. 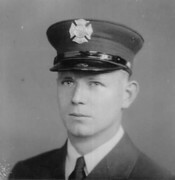 The 9th New York City Fire Commissioner - Robert Adamson worked during his tenure to have the entire department motorized. 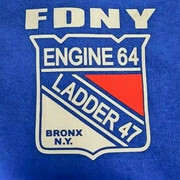 Ladder 148 was an early part of that movement. Thank you for attending this celebration and honoring 100 years of devoted service to this community. I often reflect on the friends we have lost, however there is no greater tribute to their memories, than assemble here today and reflect on our history. My heart swells with pride to witness friends, retired and former members, as well as our current firefighters, gather together, to insure this Centennial Celebration was an enormous success. It was your perseverance and attention to detail that accomplished this enormous task, and for this I am forever grateful. There is an old proverb “The more things change the more they stay the same” This will always ring true for the NYC Fire Department. If Captain O'Keefe walked thru the doors of the firehouse today, the changes to the neighborhood, the fire service, and the world, may be unimaginable, but the one constant is the perpetual brotherhood. He would feel right at home. Today, much like Captain O’Keefe in 1914, I find myself surrounded by hardworking firefighters dedicated to making Ladder Company 148 the best in the FDNY. It is my honor to be part of that future. Fireman Gerald T. Hanley died of smoke poisoning while fighting a small blaze at 1179 51st Street. He was the second Probationary Fireman killed in Brooklyn in less than a month. Hanley and two other members of Engine 282 rushed into the smoke filled apartment at 1179 51st Street and all three were overcome by the smoke. Rescue 2 worked over Hanley for more than three hours before he was pronounced dead. Fireman Dunn, one of the other members overcome, was a classmate of Hanley, but he recovered. James Dingee, Engine 282, was inducted into the US Navy during World War II. His armed service number was 8087463. He was killed in action. He was assigned as a Navy firefighter to the USS Narragansett (AT-88), a Navajo-class fleet tug constructed for the United States Navy during World War II. Her purpose was to aid ships, usually by towing, on the high seas or in combat or post-combat areas, plus "other duties as assigned." She served in the Atlantic Ocean and, at war’s end, returned home proudly with three battle stars to her credit. At 0430 on 23 August, the Luftwaffe raided Palermo, with bombs scoring on nearby service craft and a near miss wounding two of AT-88's crew. Narragansett's remaining crew immediately set to work to aid the damaged vessels despite explosions which exacted a heavy toll among the fire fighters and damage control sections. Six were dead and 12 seriously wounded before it was over. Captain Thomas Kearns died at a working fire at 187 Pearl Street from smoke inhalation advancing a hose line while working at Engine 207. He died as a result of injuries sustained in the performance of his duties. LT Philip Petti died at the World Trade Center September 11, 2001. James Dingee, Engine 282, enlisted in the US Navy during World War II. His armed service number was 8087463. He was killed in action as a firefighter in combat when his ship was attacked by enemy aircraft. 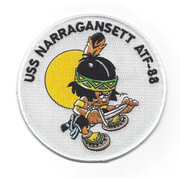 FF Dingee was assigned to the USS Narragansett (AT-88), a Navajo-class fleet tug constructed for the United States Navy during World War II. Her purpose was to aid ships, usually by towing, on the high seas or in combat or post-combat areas, plus "other duties as assigned." She served in the Atlantic Ocean and, at war’s end, returned home proudly with three battle stars to her credit. At 0430 hours on 23 August, the Luftwaffe raided Palermo, with bombs scoring on nearby service craft and a near miss wounding two of AT-88's crew. Narragansett's remaining crew immediately set to work to aid the damaged vessels despite explosions which exacted a heavy toll among the firefighters and damage control sections. Six were dead and 12 seriously wounded before it was over. FF Dingee was one of the firefighters KIA. 2002: E 282 moved to E 250 on Foster Avenue. Engine 68/Ladder 49 firehouse 1160 Ogden Avenue Highbridge, Bronx Division 6, Battalion 17 "The House on the Hill"
Combination Engine 68. The company was assigned all new apparatus: An American LaFrance 4th size steamer, a Gleason & Bailey 40' roller frame ladder truck, and a Sebastian hose wagon. One captain commanded the Combination Companies and a lieutenant rode on the ladder truck. 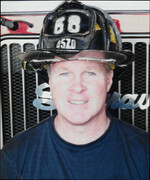 Engine 68 was painted on each rig, and could be manned by any member assigned to the company. A response could consist of all three units or the ladder truck only. On February 15th, 1908, Ladder Company 36 was placed in service at Engine Company 43, covering Morris Heights and High Bridge. Combination Engine 68's Gleason & Bailey ladder company was removed from front-line service. 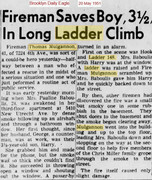 The early 1900's saw rapid growth in High Bridge, and the over-worked members of Engine 68 were feeling the need for a full-time ladder company. On December 23rd, 1913, Ladder Company 49 was placed in service in a new firehouse at 1079 Nelson Avenue located directly behind Engine 68's quarters. Engine 68 and Ladder 49 remained in this configuration, in different firehouses and responding onto different streets for over 30 years. After World War II, New York City conducted a study aimed at closing and combining firehouses. 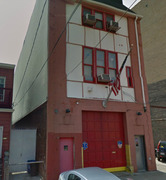 Shortly thereafter, Ladder 49's firehouse on Nelson Avenue was closed, and they were moved into Engine 68's quarters on Ogden Avenue and piggybacked. 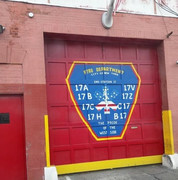 Engine 68 was parked in front of Ladder 49 in a single-door firehouse in a single-file configuration. 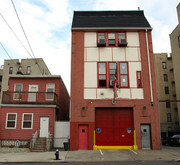 Ladder 49's quarters at 1079 Nelson Avenue is privately owned, and still stands today. 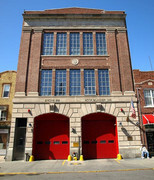 The 1898 firehouse located at 1080 Ogden Avenue was of English Tudor design, and was the only firehouse in New York City to have this look and design. The building had a single door for the apparatus to exit, and a housewatch located in the front. The second floor front housed the officer's room and sleeping quarters. Directly behind the officer's quarters was one large sitting room for leisure time between alarms. The firemen's bunk-room and bathroom were located in the rear of the second floor. The third floor had another large sitting room and lockers for the firemen. 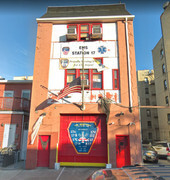 Due to the age of the building, the firehouse was remodeled in the 1960's. As a result of the remodel, the original English Tudor appearance was removed, as well as the original front dormer. 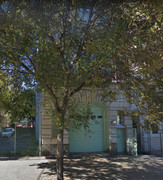 On September 19th 1979 a newly built two-bay, two-story firehouse located at 1160 Ogden Avenue was placed in service and is the present day company quarters of Engine Company 68 and Ladder Company 49. 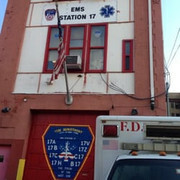 The previous company quarters at 1080 Ogden Avenue is still in use by the city as EMS Battalion 17 today. Several members of Engine 68 and Ladder 49 have made the Supreme Sacrifice in performance of their duties to New York City and their country. 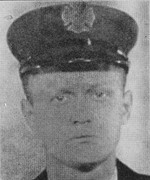 On January 11th, 1946 Fireman George M. Williams (L-49), serving as a Corporal in the U.S. Army was Killed in Action while serving in World War II. His military records indicate his theater as "India", and that he was serving as a "Personnel Officer. He was 26 years old, and is buried in Long Island National Cemetary in Farmingdale, NY. On January 31st, 1965 Fireman James F. Hipple (L-49) was killed from injuries sustained while operating at Box 75-2575 located at Gerard Avenue and East 167th Street. 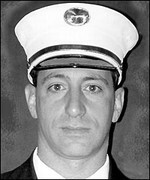 Fireman Hipple was 39 years old and had 12 years on the job when he was killed. FF James W Thompson died as a result of injuries April 27, 1915. While responding to Box 433, Engine 68 collided into a trolly car. FF Thompson and 2 horses lost their lives. FF George M. Williams served as a Corporal in the US Army in World War II. His theater of war was India. Fireman James F. Hipple responded to Bronx Box 7-5-2575, Gerard Avenue and East 167th Street, at 7:10 in the morning. The company returned to quarters and Fireman Hipple went home at 9:00 a.m. He was walking to his car and collapsed in the street. He was taken to the hospital were he died from a massive heart attack. 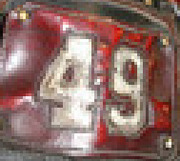 He was appointed to the Fire Department and Ladder 49 on January 1, 1953. He was thirty-nine years old. 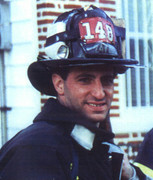 (From "The Last Alarm"
Battalion 17 was reorganized on 11/16/98 under the Command of Captain J.R. Rivera. I had the pleasure of working for and with Capt. Rivera when we were both in Queens. A great boss and nice guy!